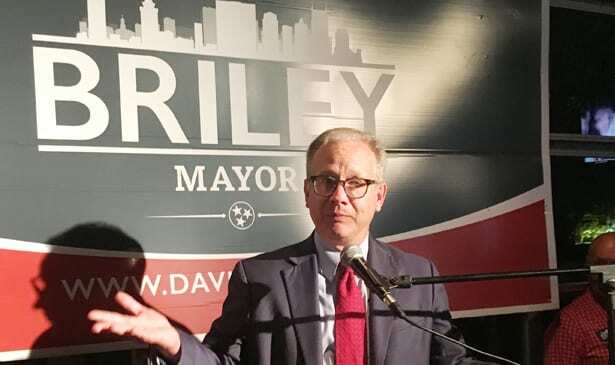 NASHVILLE, TN Mayor David Briley will keep his job at least for another year. In a crowded field of thirteen, the 54-year old Briley got 54 percent of the vote and avoided a run-off with conservative challenger, Carol Swain. About 20 percent of Davidson County’s 398,379 registered voters cast ballots in the special election May 24. Of the 82,082 votes cast, 44,707 voters picked Briley. Swain got 18,795 votes, or 23 percent. Less than a thousand more votes for Swain could have forced a run-off. The Special Election cost taxpayers about $1 million. Considering Tennessee ranks dead last in voter turnout, participation in the city’s Special Election was higher than expected. However 10,000 fewer votes were cast for mayor than the number of voters who rejected the Transit referendum May 1. The Transit Plan lost by a nearly 2 to 1 margin. Less than one in ten voters between 18 and 25 in Nashville bothered to vote in the last mayoral election. Davidson County turnout was 12 percent in November 2016, according to the Secretary of State. Former Mayor Megan Barry won the 2015 mayoral election but resigned in March 2018 after admitting to an affair with her bodyguard. Barry pleaded guilty to a felony for misuse of public funds, paid a fine, and is on 3 years probation. Briley’s victory means he will serve out the rest of Barry’s term and a new mayor will be elected in August 2019. “We know that we have challenges but we deeply understand and appreciate the fact that our city is going in the right direction, that we are committed to each other as much as we are committed to ourselves,” Briley said. Briley told the crowd of several hundred supporters at the Cabana in Hillsboro Village that Nashville has lower unemployment, more building, and more wealth than ever before. “But it’s clear to me in the last few weeks and in the last few months that we have got to come together more as a community to lift up the people who are not getting moved up by the wave,” he said. Surrounded by supporters, Dr. Carol Swain has not ruled out a run for the Mayor’s office in 2019. A few blocks away, Swain supporters gathered at the Vanderbilt University Club. In her concession speech, Swain congratulated Briley and said she would not rule out another run for mayor next year. “Money in politics matters. 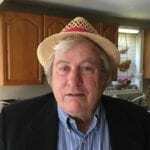 We were outspent by 6 to 1,” Swain said. 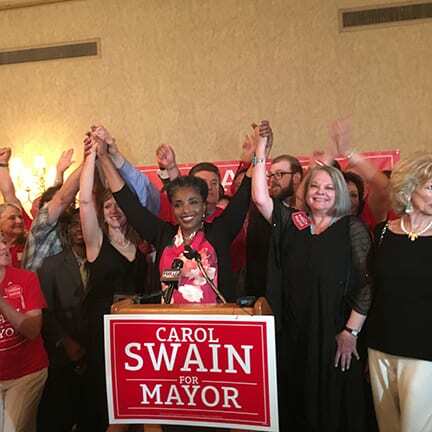 During her brief 7-week campaign, Swain criticized City Hall for ignoring less affluent districts and called for an end to sweetheart contracts with corporations and downtown developers. Swain said Briley should fire Metro’s Chief Operating Officer Rich Reibling and replace Chief Steve Anderson. “I loved meeting the people, I loved going places. I mean I went to homeless camps, I went to all kinds of churches and ceremonies. I went to the Vietnamese community and Chinese functions and I really loved that process,” Swain said. Meanwhile, across town at Edley’s Bar-B-Que on Main St in East Nashville, Jonathan Hall was mapping out his strategy to win the runoff election for the District 1 council seat, vacated by Nick Leonardo, who supports Hall. Dr. Rev. Judy Cummings finished second in that race with 28 percent of the 3,190 votes cast. Hall received 1091 votes, or 34 percent of the total. There were five candidates running and since none got over 50 percent, there will be a run-off election Thursday, June 28. Early voting begins June 8 until June 23. Only residents who are registered in District 1 are eligible to vote. A confident Hall said he was going to build on his lead over Cummings and was looking forward to hitting the ground running in council. He noted he’s been advocating for development in Bordeaux for two years. 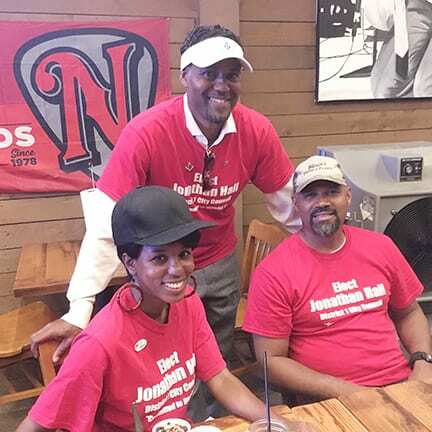 Jonathan Hall at Edley’s Bar-B-Que in East Nashville celebrating his lead in the District 1 Council race. The run-off will be June 28.
conversations with the mayor and council will be saying ‘look, this is what you’ve done everywhere else’,” Hall said. Hall said the last three administrations have reacted to federal fair housing assessments in the same way. Bordeaux has consistently gotten the short end of the stick. Housing programs have concentrated poverty and resources have deliberately been withheld from Metro’s largest district with the most voters. Hall is supporting a resolution by District 5 Councilman Scott Davis to rewrite the city’s nondiscrimination procurement rules. After ten years, black-owned firms are still getting less than 3 percent of the city’s business. “It’s only the beginning. I’ve already drafted two pieces of legislation that address the exact same thing,” Hall said. Dr. Rev. Judy Cummings who trailed Hall by 205 votes, predicted she would defeat him. “I am the candidate who has the voice voters believe is able to be their advocate and I have already established relationships with the mayor’s office, with the mayor, and other colleagues on the metro council,” Cummings said.